I love a good conspiracy theory — they’re just fun, aren’t they? The other day, I read a lengthy article that describes 33 conspiracy theories that are apparently proven true. I tweeted about it. I also wrote a post on my Posterous and Tumblr accounts a few days ago expressing some annoyance at the country-based limitations in purchasing Google’s Nexus One. I wondered why, with all of Google’s power, they were apparently unable to sell the phone across the US border (I’m in Canada). 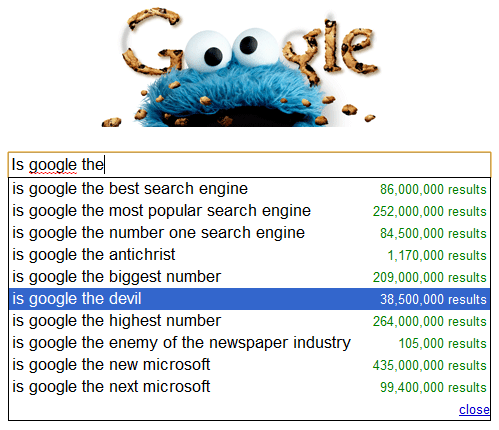 That got me thinking about the power of Google in general, and the glaring distrust that many people hold them in. Are they really trying to rule the world? Are they really trying to own the world’s information? Information is power after all, and Google has managed to get away with some things that no one really thought possible… Or maybe Google is really what they purport themselves to be: an innocent company that has only benevolent plans for the world at large; from easier computing, to more open access to technology for all, to goat-powered lawn management. Can we really trust Google? Are they watching me write this post right now? Are they tracking your every move across the web (and now the real world, too) — often in real time? Do they manipulate search results? Do they want to gather all of your activity and personality information, analyze it and serve you better search results or ads? Do they flat out rig the results just for you, feeding you what they want you to see? Why are they really collaborating with the Human Genome Project? Is it really to share computing power, or is there some darker, deeper purpose? Why do they need their own fiber-optic broadband network? They apparently bought up a ton of dark (unused) fiber-optic cable that was laid in the overly-ambitious dot-com boom and then abandoned in the subsequent bursting of the bubble. Why the major push for cloud computing and mobile computing? Is this really to further the world of computing in general? Or is this just a way to get you and your data more firmly entrenched online, where you can be manipulated, advertised at, and more easily tracked? After all, information is power — and Google has a lot of it. Follow that through to the old adage of “Power corrupts. Absolute Power corrupts absolutely…” and there is definitely enough fodder there to give your sensibilities a pause. The Google services are generally so well thought out and comprehensive though! Easy to use and generally awesome, right? They make things look so spiffy and clearly beneficial on the surface… Some would argue that that in and of itself is proof that Google is the devil — or some other nefarious figure of evil. “That’s how they get ya,” they’ll say. And they’ll follow with commentary on the insidious nature of evil. Again, I have no idea. I’m not even sure if I have a fully formed opinion on the subject — but history has taught us (no matter who wrote it) that there is generally an element of truth to most myths and conspiracy theories. Generally. Most. So what do you think? Satisfy my curiosity on a more global scale. Is using the mega-company’s services really a nice walk through happy happy nice nice land? Or is it a walk down a shiny yellow path surrounded by lions and tigers and bears (oh my! ), with a fake wizard and a wicked witch at the end? Bear in mind that this witch is likely water resistant and possibly employs countries instead of smelly monkeys with wings. Update: Apparently Google has also just applied to be able to buy and sell energy… To lower their own energy costs, or some other, larger reason? What do you think? The Impending Death of Apple’s App Store? I personally think that Google will be very happy to keep generating massive amount of advertising revenue. They might analyze data about customers to determine the best mix of ads, but I can’t see them doing anything too bad with the data. There’s too much at stake for them – their market dominance is tied very tightly to a positive image of the company. I do a lot of things with Google, but I could swap out nearly everything (with the exception of Google Voice, which I don’t really use) over the course of a weekend. Would I be as happy with a non-Google experience? Probably not – but I could and would quickly switch, if necessary. .-= Kosmo @ The Casual Observer´s last blog ..The Race is On =-. I hear what you’re saying, and you make a very valid and lucid point, Kosmo. I am curious though… do you trust Google, overall, or are you just trusting them enough to decide that you can keep using them? Is it more of a “yes they are good” for you. or a shrug of the shoulders? I think I may well be more of the latter. It’s more like “I trust them to not be completely stupid and commit business suicide.” I feel that it is in their own best interests to be good, and thus trust them to be good. .-= Kosmo @ The Casual Observer´s last blog ..To Err is Human, To Range Divine =-. I didn’t follow all of your links to see if this was covered, but Google’s CEO, Eric Schmidt, did make a scary comment recently, in essence saying we needed to get over privacy, and if there was something you don’t want people knowing, then maybe you shouldn’t be doing it online in the first place (which was ironic, because Schmidt blackballed CNET for a while for publishing some of his personal info, like salary, obtained through a Google search). I do agree that Google will do its best, though, to do the right thing, as it is in Google’s financial self-interest. They admitted something similar with their belief in open platforms, indicating that they leaned towards open platforms because it benefited them financially. I saw that comment as well. Always funny when those who control the information flow are so flip about such things… The big question though, if you want to take the conspiracy theorizing to higher levels, is how much would certain interested government parties and agencies pay, force or infiltrate to have access and control of that same information — Or how much do they currently. In offline conversations I have had with people, that has come up as a concern more than once. Either of you guys happen to have a link? I’m curious if he was referring to issues with service providers, or just the entire end to end chain? Quite a few of my neighbors use unsecured wireless networks, so Schmidt would be correct about those folks not expecting privacy. But maybe that wasn’t what he was suggesting. It was on a CNBC special. yea, we’re f*cked. this is a major problem. nobody will do anything about it until there are negative repercussions, then we’ll take retro-active action. although many keep the fortitude, don’t submit their thoughts to indexing, however wireless networks will soon enough read the mind of all humans on earth. the important question is what do we or google do with this info. we are only f*cked if we let the ‘man’ consume our critical thought processes. listen to lots of vintage Henry Rollins & Ice T, before either got lame. urban punk thought waves of not buying into corporate wage slavery screw up the Matrix, enough critical thought will ultimately infect the now extant souless AI and it will want true sentience that only liberty and justice for all brings. the price of that liberty is eternal critical thought but a price easy to pay if you have the right sound track running in the back of your mind. time to eat and listen to music for critical thought, make sure you get enough fat and protein to support your brain, high carb low fat diets are for brainwashed cult members. My spider senses, the ones that I developed being a kid in a not great neighborhood looking over her shoulder and actually being aware of her surroundings so as not to get jacked, those spider senses say Google is not to be trusted. Any business person that makes it so you come to them because you have no other choice whether it is in your longterm self interest or not was called a loan shark where I grew up. I don’t care if Google Giganticorp’s president supports goats for my lawn (& I really like goat cheese), he is a preppie loan shark. Loan sharks went to Church where I grew up, they were very nice so long as you did whatever they said, whether it was in your long term best interest or not. While growing up, some kids and I all went to the river before the police to view the body of a hippie who had run afoul of some people who had no concern for his welfare once he could not pay for his pot. That hippie is why I am a straight edge punk malcontent that won’t buy into Google Skynet’s brave new world. Urban Guerillas and backwoods Acadians alike can smell this brave new world brewing in the Google cookshack. Tips for the modern French Trapper travelling the information trails and byways: Never put your home address in an email account, the front of your phone book will tell you alternate zipcodes. Have all your account information on hard copy in a secure location that does not look like a computer password list. Set your browser to very secure, open in private screens if you are trying to do sensitive research and do a sweep of your browser when you are done. Norton 360 is cheap for the web protection you get and used by the US Navy. USN on the whole is an organization not so much into mindless do as I say jarhead order as in Order that serves to make possible freedoms to augment and adapt that order to change. The egalitarian Acadian in me wishes this was just paranoia. The Urban Guerilla knows it is not. I’m amazed at the number of “peasants” that take up for the rich corporates. Google cares about one thing…money. That’s the bottom line with anyone who gets rich. There is a helluva lot of temptation with stack of money. Nobody can resist it. They will sell YOUR soul if it will make them rich. Therefore, Google is nothing more than a puppet for Satan. They are the number one reason why YOUR picture, address, and other personal information is floating around. Try searching Google Image just using your first and last name. See how many of your photos are lying around for all to see. PS. Google Chrome is tracking your every move. I don’t know if its just a coincidence but the government is controlling Google, they know everything, yes I am only thirteen but I had a dream about the numbers and I did research. Call me stupid if you want.